I am in the process of moving to Texas, so I have a guest blog post! Collaboration and communication with other modelers who have similar interests can spur progress on a number of projects. My friend Harold Oakhill is modeling the Ulster & Delaware Railroad in the heady days of the early 1920s. 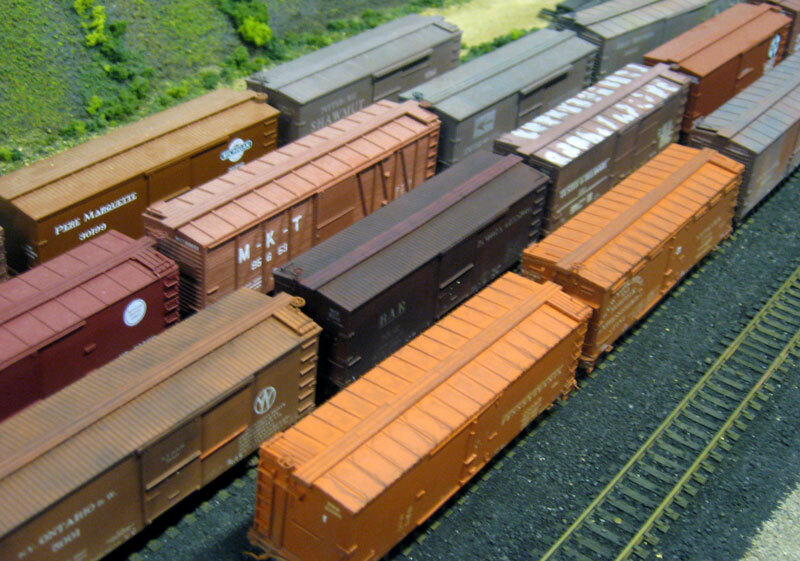 We regularly discuss developing an era-specific freight car fleet. Of the many details, paint and lettering are frequent topics. Harold recently wrapped up a few HO scale Westerfield Pennsylvania Railroad XL box cars, which were the backbone of the huge PRR box car fleet in the early 1920s. Please follow along as Harold discusses his concerns and methods in the finishing steps for these models. A few weeks ago Eric sent me the above photo of a Westerfield Pennsy XL ventilated box car I had built that was awaiting decals and weathering. I recently finished that box car, and another XL, so I thought I would share the finished products. This project has been the focus of a running discussion between Eric and me over the correct color for these cars. I had built 6 of them (3 straight XLs, 2 ventilated and 1 automobile version) And I was wondering what shade of “box car red” to paint them. I was going to go with a reddish shade that Westerfield used to show these models on its website. I had mixed up some paint and painted one as a test, when Eric and I saw two of these models that Todd Sullivan had built for Perry Squier’s Pittsburg, Shawmut & Northern layout. They were orange. They were also heavily weathered, but were definitely orange. Here’s Todd’s box car in service on the Shawmut. We asked Todd about the color and he said it was a 50/50 mix of Polly Scale Zinc Chromate Primer and SAL Orange. He had found this paint detail on the Keystone Crossings website. I looked it up and sure enough, there it was. With such confident info from those who I figured would know best, I dove in. I got a 1 oz. jar of each color, dumped them into a 3 oz. jar, thinned it a bit with distilled water and painted all six cars, including the one I had already painted. Because of Todd’s heavy weathering I was not prepared for the result. They were ORANGE! You know those candy corns people hand out at Halloween? THAT shade of orange. Bright…..neon….in your face ORANGE! I thought I had ruined them. And here are a few different cars to compare from a trackside angle. I brushed a liberal wash of my homemade “rusty mix” on to the underbody and steel side sill. Todd Sullivan had suggested this and I like the effect. I think I will include this as a standard step for my weathering from now on. See the photo below showing side by side cars, one with, one without the rusty mix . Air brush several coats of the orange paint, diluted very thin, to tone down the lettering. The decals are a very bright white. Air brush a coat of thinned Polly Scale Earth along the bottom third of the body, sides and ends. I use a mask to create the columns of mud on the ends splashed up from adjacent cars. Air brush two thin coats of Poly Scale Steam Power Black on the roof. Air brush several thin coats of Polly Scale Grimy Black over the entire car. I keep adding coats until it looks right. With a small brush I add some more rusty mix on some of the iron work, like corner braces. The trucks are weathered separately and get a similar treatment of Earth and rusty mix, with Polly Scale Oily Black around the journals on on the faces of the wheels. 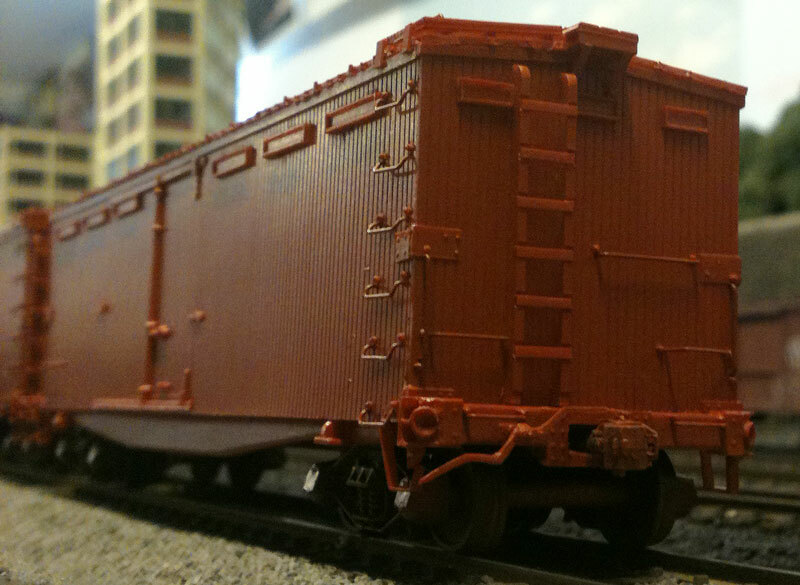 Here are weathered and unweathered underframes to illustrate how the PRR freight car color is toned down. Many thanks to Harold for providing an interesting blog post. The Pennsylvania Railroad (and affiliates) rostered over 37,000 XL class box cars that were built between 1902 and 1916. As the X29 class steel-sheathed box cars came into use in the mid-1920s, the PRR began moving large portions of the XL class into storage. Scrapping of this iconic box car fleet began in the very late 1920s and early 1930s as these cars of short length and short height were now an outdated design. Readers are welcome to comment. Please leave a comment below. All comments are reviewed and approved before they appear here. Nice work! Yup, they were an orangish red. 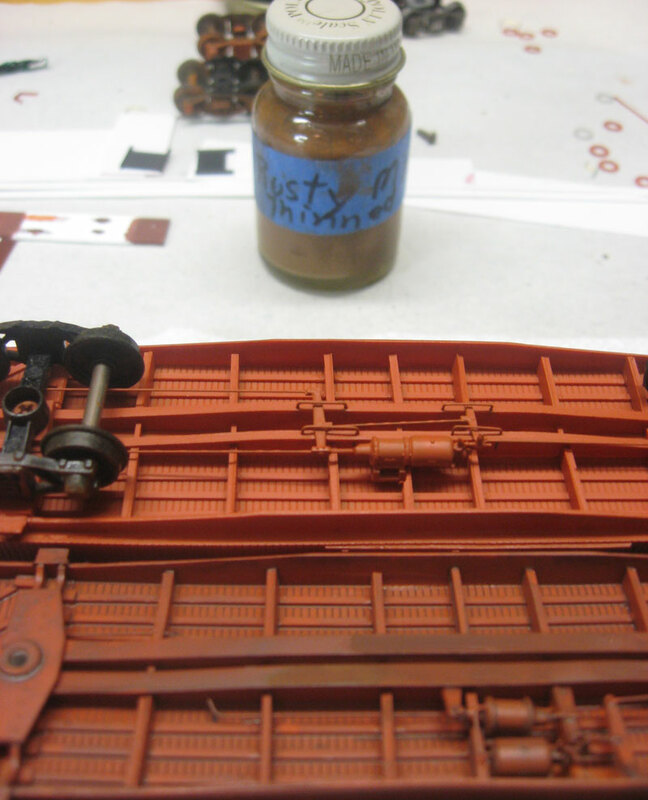 Personally, I find the recipe used a bit too orange for a prewar PRR Freight Car Color, but it is close and a good base for weathering. The actual paint was an iron sesquoxide (sp?) which combined with japan dryer in varying amounts as well as other finishing components gave an orange hue. Nice modeling! It does appear too orange for my taste as well. I’m also modeling the PRR in the 1920s and I use verious mixtures of Special Oxide Red and Reefer orange. This gives some variation (simulate fading and oxidation of the paint, etc) which I figure is normal but I tend toward the red side of the paint color. Look at the models on my website and see what you think. I just ran across a builder’s photo of a PCC&StL Xh box car in December 1899 and even though it is in a black and white photo it sure looks like it might have a lot of orange in the paint. So it could be that Pennsy cars were painted with a orange hue to it just like people tend to different opinions on what kind of green to use for painting a Pennsy SD9. I love what you did to these cars. It gives the a sort of character they didn’t have in their original condition. By the way, love the orange. Vallejo “German Orange” (70805) seems to be a close match for the more orangey color in ‘rooftops’ and ‘undercarriage weathering’ shots. Vallejo “Amarantha Red” is a better match for PRR 21085 and NYP&N 2750. I’m going to use the latter for my Amesville Shop XB/XC builds, but use the former color to fade out the paint and lettering on older cars. Next Next post: Another guest post!